Are you all aware that the Super Bowl is this weekend? I’m hardly a football fan, but I love the Super Bowl because it means I get to lounge around with friends, drink beer and stuff myself with salty crunchy things. I honestly don’t know who’s playing this year (my sports fan mom could tell me), but that’s besides the point. I’m just looking forward to chit chatting and munching away. 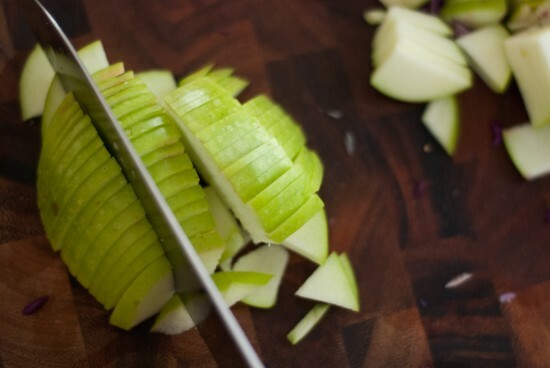 Today I thought I’d share this mayo-free apple slaw that I’ve been snacking on all week. It’s a chomp-worthy salad that, come game day, will offer welcome relief from the salty chips and creamy dips. It boasts a satisfying crunch and an irresistible sweet, tart and tangy flavor. Plus it’s festive and full of phytonutrients, though antioxidants will probably be the last topic of discussion during the game. It took me three times to get this slaw just right, and I’ve been chomp-chomp-chomping away at the leftovers for days. 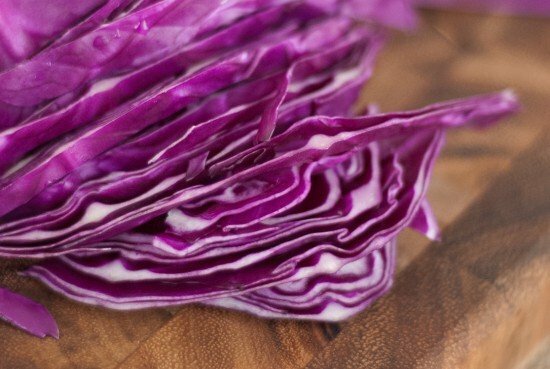 The first time, I added an entire purple onion as directed, and it tasted like onion slaw. Yuck. 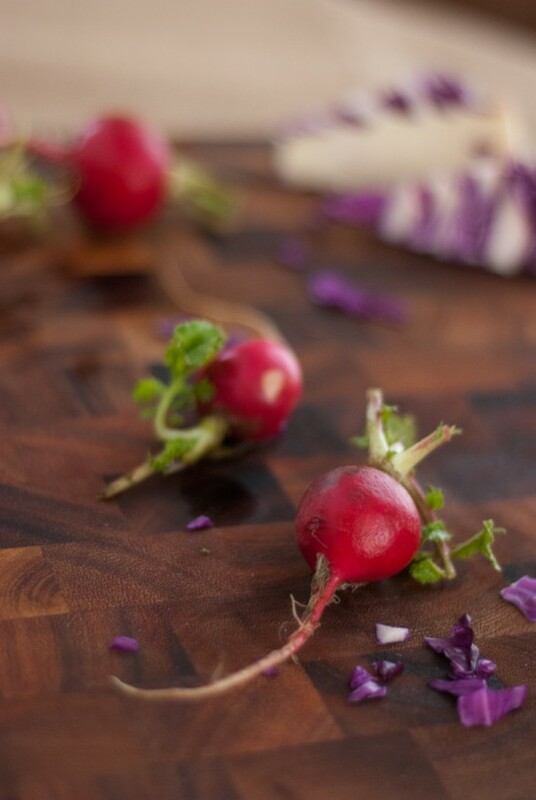 I decided that the radishes and mustard gave it plenty of kick, so I skipped the onion altogether on my second try, and tossed in a combination of parsley and mint. I love parsley, I do, but it didn’t seem like a good fit here. The last time, I traded cilantro for the other herbs (à la the green machine smoothie), and it was just right. By the way, if you’re on the hunt for more game day-appropriate dishes, you might consider this sweet potato chili, which satisfies carnivores and vegans alike, or a giant bowl of black bean salsa. Don’t forget about sweet potato hummus, spiced chickpeas or molasses cookies, either! Also, while we’re on the subject of salty crunchy things, check out my favorite food over on Adrienneats today (mm, sweet potato fries!). 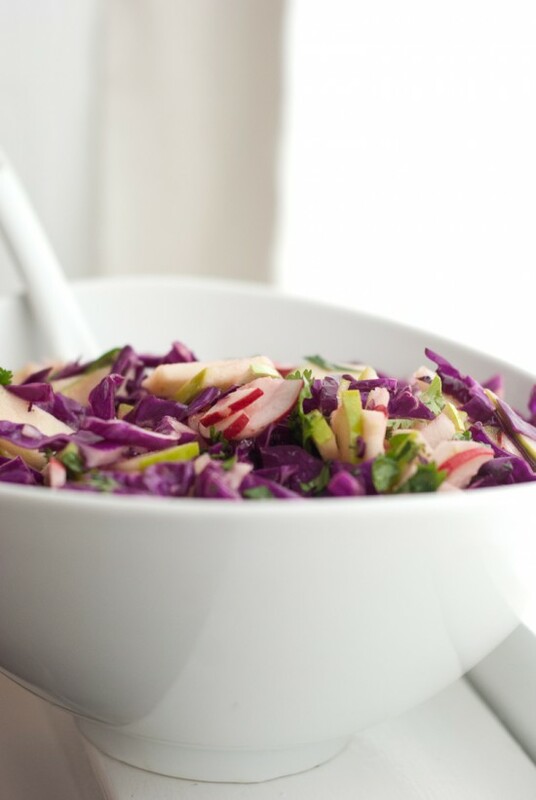 Crunchy cabbage and apple slaw for game days or any day! Recipe yields 4 side salads. Cover and chill in the fridge for an hour. Mix in the chopped cilantro right before serving. 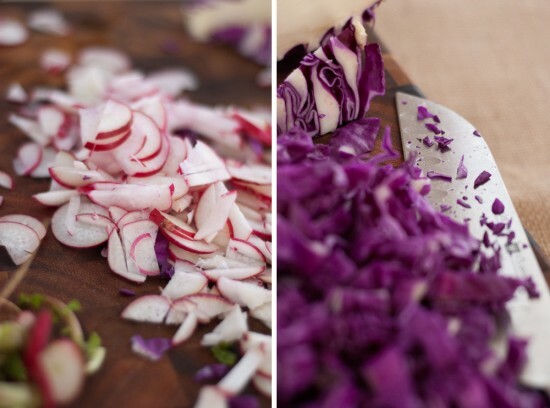 This slaw is best eaten within a day, if not sooner. Make it vegan: Swap the honey with agave nectar. Change it up: For extra sweetness, mix in some golden raisins. that. looks. like. a. dream. Thank you, Julie! Me too!!! 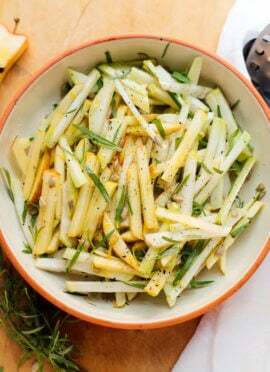 I love the idea of the salad, but i was wondering as to what you may recommend as a substitute for dijon mustard (not too much into how it tastes)? Hey Abeer, thanks for following! The Dijon mustard taste is subtle in this recipe and contributes a bit of a “je ne sais quoi” flavor. If you like any other kind of mild mustard, I would use that. If not, I think you could go without the mustard altogether. 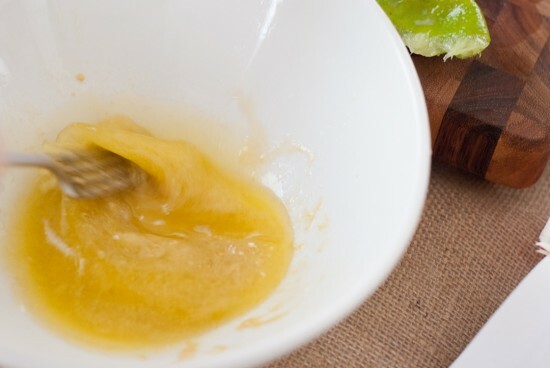 You might want to add some extra lime juice or maybe even some finely sliced green onions to make up for mustard’s extra kick, but try it without mustard first! 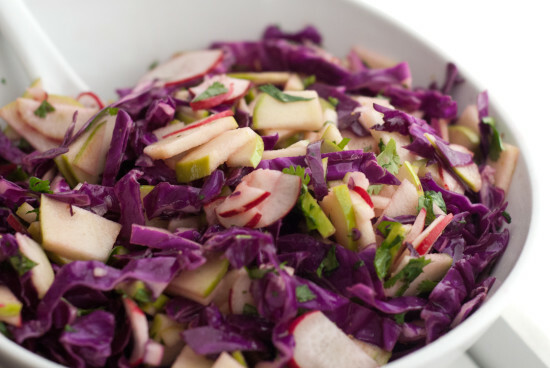 I have been eating more salads than ever before and this slaw looks like a recipe to try! 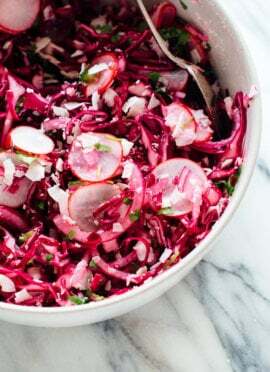 I love slaw and foods that don’t require mayo to taste good. This looks wonderful! glad to hear your recipient is making out well. i signed up for ‘be the match’ a month or so back and was curious about your experience. thanks for sharing. This looks amazing! Love the pics and absolutely need to try this! Can you give # of servings ? And how much per serving? (1/2 or 1 cup? etc). Also, how do you serve? Main, side (with what? ), thanks. Hi Jill, I’m sorry I didn’t provide that information. If memory serves me correct, this recipe yielded about 5 cups of slaw. I’d serve it as a side, maybe a heaping 1/2 cup per person, or 1 cup if you want it to be a more substantial salad-type side. It would be great to bring to a potluck. I think it’d be great with a grilled cheese sandwich, too. Hope that helps. Made and served this along with dinner last night, and knocked everyone’s socks off. 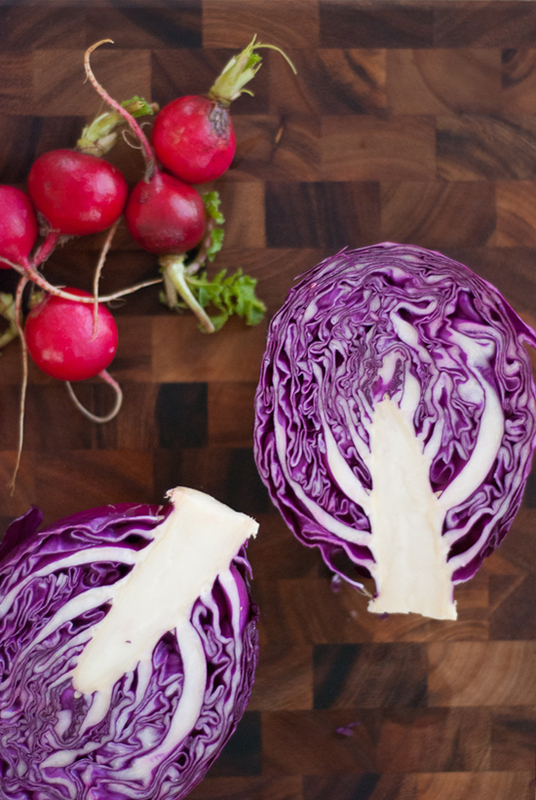 I love the fact that your Winter Slaw recipe is mayo-free. I’m not a mustard fan, but decided to try the dressing as is, and was pleasantly surprised about the taste. I julienned the apple. This is a simple but delicious and appealing recipe. Thank you. You’re welcome, Lina! I’m glad you enjoyed it. 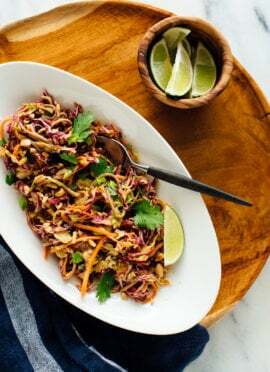 I’ve been searching for a decent cabbage slaw to pair with bbq and that isn’t loaded with mayo and this one is delicious! I’m sure I’ll be making it again soon. Thanks for the recipe! You’re welcome! Thank you, for the review.